The Eicher Arts Center is a spectacularly beautiful community venue located in the heart of Ephrata, Pennsylvania, that currently hosts weddings, public gatherings, community events, and more. However, it was not always used for this purpose – in fact, it was much smaller when it was first built in 1734 as a home for local Daniel Eicher & his daughters Anna and Maria, who were members of the local Cloister community. Over the few hundred years it has been standing, additions have been added on for different purposes. It is one of the oldest buildings in Lancaster County, and the structure you see today is full of history. The Eicher Sisters' Cabin is the present day Indian Museum and Shop. Switzerland had been the home of the Eicher families in the 1600’s. The great opposition to the Anabaptist movement in Switzerland compelled the Eichers find another homeland, and they moved to Germany. When William Penn opened Pennsylvania as a refuge for those who would not adhere to the state religion in Europe, Daniel Eicher (1680-1774) saw an opportunity to go to a land where he could freely practice his religious philosophy. In 1718, Eicher and his family were members of the Coventry community, located in present day Pottstown, Pennsylvania. In 1726, Eicher attended a love feast at the home of Rudolph Nagley, a follower of Johann Conrad Beissel (the founder of the nearby Cloister), in the present day area of New Holland, PA. Eicher’s daughters Anna and Maria left their home in 1726 to join Beissel’s German Baptist group. In 1732, Ephrata was settled by this German religious society under Johann Conrad Beissel. The men and women formed the Society of the Solitary Brethren. The community was self-sufficient; it’s building, known as the Cloisters, housed 36 brethren and 35 sisters by 1740 and is a historic landmark in Ephrata that still stands today. In the same year of 1732, Eicher built a cabin as a residence for his daughters Anna and Maria on the east bank of the Cocalico Creek, which is now the Eicher Indian Museum and Shop. 1734, Daniel Eicher moved to Ephrata with the rest of his family, and was deeded a 100-acre tract of land by William Penn. He then built a cabin for his family, which is the present day Eicher Arts Center. This home is the first recorded two-story house, with both a cellar and an attic, in Northern Lancaster County. Directly adjacent to his daughters’ cabin, the Eicher land is a big part of today’s Ephrata Park. The large Eicher house later became an Inn, and eventually housed the traveling actors who performed at Ephrata’s nearby Playhouse-in-the-Park. In 1777, due to an epidemic in Ephrata, most of the original buildings of the nearby Ephrata Cloister were destroyed. 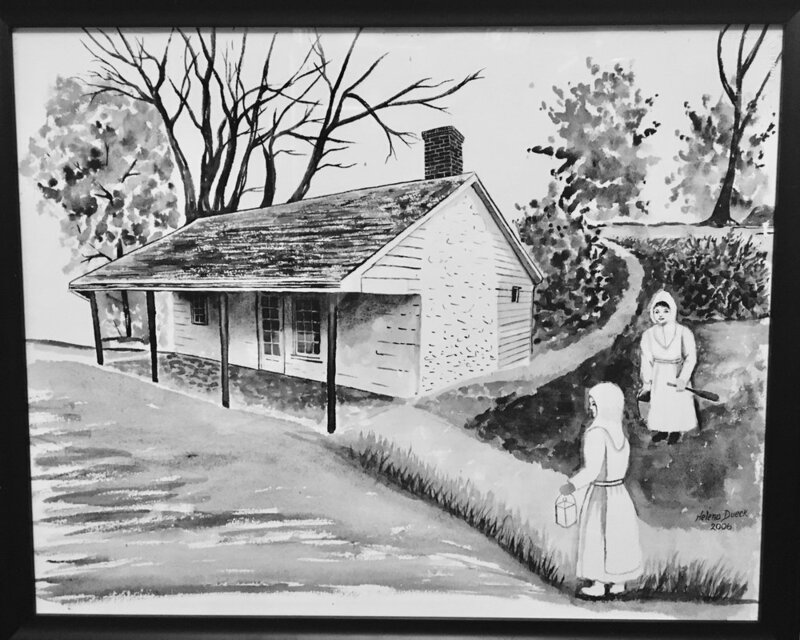 However, the Eicher sisters’ cabin, on the other side of the Cocalico Creek, was spared from destruction because of its separation from the Cloister proper, and is still standing today. Restoration of the Eicher Cottage & Eicher Sisters' Cabins was completed in 1985. Over the years, the Revolutionary war, Civil war, World War I and World War II all left lasting marks on these 2 buildings, but they survived despite the ravages of times and elements. Time and decay had taken its toll, and the Eicher house and Eicher Sisters’ cabin was no longer deemed safe because of decay, deterioration, and neglect. As a result, in 1983 the buildings were slated for demolition. Randall Klinefelter & Austin Hess then formed the Eicher Arts Center organization in order to save these historic buildings. This group of 60-80 people was assigned to the monumental task of salvaging, restoring, and renovating these two buildings. Despite all of the obstacles, with the wonderful and dedicated support of community-minded citizens, the restoration and renovation was accomplished in 1985. It was a treasure, a wonderful asset to the community, a link to the past, and a perfect setting to promote, encourage, and enhance Art and Culture here on the banks of the Cocalico creek in Northern Lancaster County. Nowadays, the Eicher Arts Center is a community building that hosts weddings, public gatherings, private parties, and social events. The Eicher sisters cabin was transformed into the Indian Museum and shop in 1985. The museum has a wonderful display of local and nationwide artifacts and collectibles which has attracted widespread interest. Jim DeFilippis is the current coordinator of the Eicher Arts Center & curator of the Indian Museum and has been here for 15 years. His previous experience includes being an educator, and an assistant to museums all over New Jersey. Over the years, he has brought Eicher into the 21st century with improvements, additions - both inside & out - to enhance its original beauty. The Eicher House and grounds are available for private parties, business meetings, wedding receptions and public gatherings. It has hosted, and continues to host, many Ephrata community events throughout the years. after years of beautiful renovations! The Eicher Arts Center has been home to many, many different types of events over the years. Check out some of the events we've held straight from our archives below! The Eicher Arts Center is a non-profit organization charged with overall administration of the historical Eicher House and Indian Museum facilities. Creating an appreciation of these fascinating buildings and history the Eicher Arts Center fosters the community and public to participate in a variety of activities through intellectual and artistic contributions of individuals.